Siemens has snapped up a $466 million six-year contract to build 70 electric trains for Amtrak. The deal, which is Siemens’ first major contract with the rail operator, is a significant coup for the company which is trying to aggressively expand its footprint in America. Although Siemens has dominated in the light rail category in the US— with one out of every three light rail vehicles made by Siemens— the company is eager to lock up new deals, especially those outside of urban zones. In particular, Siemens is trying to become a major player in the high-speed rail market, which should accelerate in the coming years thanks to federal dollars. Under the Amtrak deal, Siemens will add 200 jobs at its light rail manufacturing plant in Sacramento, California and 50 jobs at plants in Georgia, which will build motors and propulsion containers for the trains. Although the manufacturing process isn’t completely green, the Sacramento plant uses solar energy for up to 80% of its power, according to Siemens’ press release. The first trains will hit the track in 2013. The new trains, called Amtrack Cities Sprinters, will be a step up from the average locomotives on the market and will feature a few green highlights to improve energy efficiency. Modeled after the European version, the EuroSprinter, these trains be able to easily maintain speeds of 125 mph. 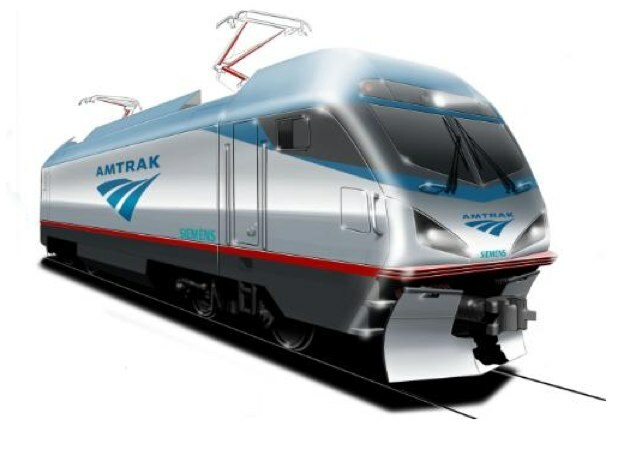 Amtrak plans to use them on the Northeast Corridor, a line that connects DC to Boston, and the Keystone Corridor (from Philadelphia to Harrisburg). A feature which will also reduce wear on the breaks. More efficient breaks will not reinvent the green wheel of the industry, but it’s certainly an incremental gain.